Note cards based on the Stained Glass Windows of Pratt Hall make wonderful Christmas cards and gifts. Buy local!! 1. The Battle of Bennington was in New York. 2. The Battle of Bennington was the first instance of the Stars and Stripes flag motif being used in battle in the U.S.
3. The American forces were led by Ethan Allen. 4. What famous route was named after the spouse of one of the battle's military leaders? At our September Board meeting Marijke reported we exceeded our 200 memberships goal for 2009, our third year in a row! Membership dues also exceeded our $10,000 goal for the third year in a row! Thank you all for your very generous support. So who are we? The median MHS member has a Montgomery address, although about half of our members are not full time residents. About 75% of our members live in Vermont. We have members from the U.S. as far away as California and Texas, and from Canada, the UK and the U.A.E. (This is why I describe Pratt Hall as the international HQ of the MHS). The median membership contribution is about $55. A little over half our members have provided email addresses for us to communicate with them. In any given year we lose about 20 members and gain an equal number of new members. Since 2006 we've lost about 75 members. Imagine our numbers if we could get even half of them to re-join. As our 35th anniversary year comes to a close this quarter, I want you all to know the Board and I are very sensitive to the economic times we are all going through. We take our responsibility to you very seriously and appreciate what you make possible. You can all take great pride in your role in preserving and promoting our community's heritage, especially in these tough times. Thank you. Steve Hays wrapped up another successful concert season in August. We were treated to traditional sailing songs from lake Champlain, chamber music, and the electric oud and tabla songs from the middle east; all by Vermont artists. Thanks to the Vermont Arts Council, TD Bank, The Eastman Charitable Foundation, and our local sponsors and patrons for making it an artistic and financial success. 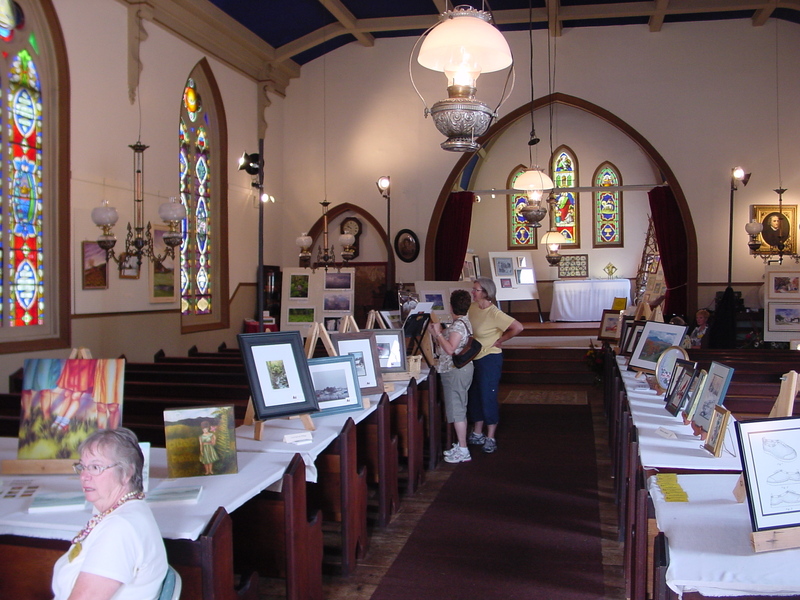 Noela McGroarty organized another wonderful Art Show and Sale, with about 20 artists exhibiting their paintings, photographs, and other media. The Society bought a wonderful watercolor of Pratt Hall by Michael Domina which we hope to use for limited edition prints and cards to sell to help raise funds. For a long time the Board has wanted to research and develop more information on the beautiful windows of Pratt Hall. While we still need to find out where the windows were made, we were able to compile information on the symbols incorporated in the windows and the family information contained on each. It is written to be used as a reference document and as a self guided tour of the windows. 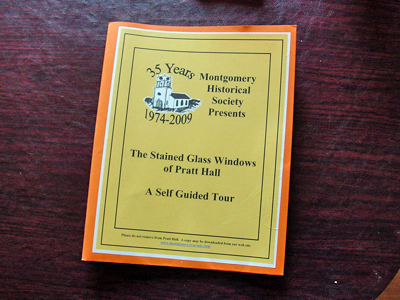 Copies are at Pratt Hall and it is available as a free download from our our web site www.montgomeryvt.us/mhs.htm. This guide is a wonderful companion piece to the Stained Glass note cards currently for sale. It can be purchased for $10.00 and so far the feedback has been wonderful. This year's community sing along is set for Friday, December 18th and will be led by maestro Andrew Massey. The program will include, stories, and light refreshments. What will this year's decorating theme be? Singing starts at 6:00 p.m. The Board approved and submitted a $15,000 grant request to the Eastman Charitable Foundation in August to help with structural repairs to the entryway of Pratt Hall. The Eastman Foundation has been a long time supporter of our concert series. Unfortunately the trust which finances many of their grants does not have the funds. The Foundation asked us to keep them apprised of our needs in case circumstances change in the coming years. We just submitted a grant application to the Vt Historic Preservation Div. for the same work on the entry. This one will require us to come up with half the funds. Keep your fingers crossed. Click here for pictures of the entryway "bones" and why we're concerned. As we approach the holiday season we continue to offer sets of our beautiful note cards featuring 16 photos of the stained glass windows of Pratt Hall. They are a great gift and make a superb Christmas card. A complete set of 16 is just $16 for members, and subsets of 4 each (Angels, Flowers, Bible, and Symbols/Patterns) are $6.00. Please email pratthall@gmail.com to order. Click here for photos and more info. The Expo will be at Tunbridge June 26 and 27th. The Theme will be "Back To The Land, Again". We will need to decide if we can muster an exhibit. Any ideas? The Board is scrutinizing our insurance coverage and working closely with our agent at Hull Insurance to make sure our policy is the best fit for our needs and means. Included in this is a 100% reassessment of both structures, and calculating a new value for the entire property and contents. This is what determines, in part, reimbursement for damages and premiums. In the past our coverage did not include the clock or bell, and in the event of other damage we would only be able to recoup about 50% for eligible items. We are considering significantly raising our deductible and other changes to better deal with significant damages other than a total loss. We will provide updates in future newsletters. The Board voted in August to pay the principal down on the Heaton House loan by $1,000. Sue also reported we had 56 Affinity Members and once TD Bank validated the information we would be eligible for at least $500 under this program. The Board decided to put money from this program towards the loan principle as well, once it is received. Thank you to all of you who designated us for this program. Members are still strongly urged to designate the MHS as their Affinity partner if they haven't already, it's free and easy. Additional information is available at our web site. Call Sue if you have any questions. Long time member, and booster, Betty Stanton suggests we compile, publish, and sell a Montgomery cookbook comprised of recipes from Montgomery residents and Montgomery lovers. The book would include any family stories associated with the recipe, cooking etc. We think it's a great idea but need someone to lead the effort. This would include forming a committee, organizing the effort, and writing and editing the manuscript. If you are willing to do this please contact any member of the Board. Thanks. Pratt Hall "Attic Bats" Become "Basement Rats"
Much of the same group that cleaned the attic of Pratt Hall in preparation for bug treatment has been working on replacing the undersized and/or disintegrating posts and footings in the basement of Pratt Hall. Pat Farmer, Ken Secor, Tim Chapin, Charlie Fichman, and Bill McGroarty, have replaced two footings, three posts, and the stairs to the basement crawl space as of this writing. Most of the older posts were small tree trunks about 4X4. All replacements are pressure treated 6X6. There are 8 posts, of which 7 will be replaced in this latest round of do-it-yourself repairs. Thanks to Tim Murphy for donating a pre-poured concrete footing, and his expert advice. 2. The Battle of Bennington was the first instance of the Stars and Stripes flag motif being used in battle in the U.S. Probably not. The flag is on display at the Bennington Museum but many believe the cloth dates to after the battle. 3. The American forces were led by Ethan Allen. False, they were led by Colonel William Stark from New Hampshire. 4. What famous route was named after the spouse of one of the battle's military leaders? The Molly Stark Trail. Col. Stark exhorted his men "yonder are the redcoats, tomorrow they are ours or Molly Stark sleeps a widow." The Molly Stark Trail is in southern VT and is reported to be the route he followed home after the battle. His flag, green with a blue canton with stars, was adopted as an early VT flag and is used by the VT National Guard today. The LLHS Annual Meeting will be in St Albans November 6th. We will attend and and will compete for an award or two again this year. All are welcome to attend. It includes lunch, a speaker, workshops, and awards ceremony. More information can be found on the VHS website or you can email us if you would like to join our group. Stay tuned for details.